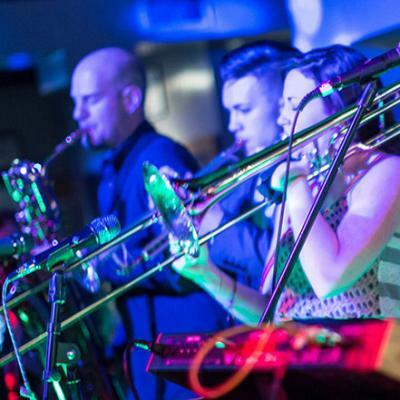 Ithaca-based Big Mean Sound Machine will be returning to Kings Rook Club on April 8, with special guests Galactic Duo. Big Mean bring their larger-than-life presence and Afro-funk style that must be heard to be defined. "It's truly a challenge to describe our sound in words, or to try to pick a single tune that exemplifies it," the band explains. However, they offer the track "Seeing The Bigger Picture" as a good start. This is also the single for the band's upcoming album Runnin' for the Ghost, which, coincidentally, drops the day before this gig. Even though potential attendees can do their sonic research, the show will still be a surprise. "Since we rarely ever write set lists and we call all our songs on stage," they say, "there's no specific song we look forward to playing any more than any other." However, attendees can anticipate a joyful atmosphere at the Rook: "We are most interested in all of our music having a spirit of positivity and being uplifting to our audience." Galactic Duo, meanwhile, is comprised of Tony Grey (bass/keys/vocals/composition) and Ian Maciak (drums), and they'll bring a similar chill vibe to the gig. The two are "looking forward to tapping into the energy of the room and creating an improvisational exchange that's exhilarating for both the audience and musicians." For those new to Galactic Duo, they suggest starting out with "Say What You Mean," as the track best highlights the band, itself. It's "a track that taps into the concept of superficiality, where people move through their day on autopilot due to societal conditioning, which becomes the stereotypical norm."